How Cool Are These Tools! Are you a handyman that’s always looking to fix something up that is broken? Well, be prepared to get your hands dirty because this auction will give you all the tools you need to get any job done! This auction has one lot that consists of 80 lbs of assorted hand tools. Included in this lot are screwdrivers, power tools,pliers, hammers, wrenches and more! These tools come in various types, styles, colors, conditions, and brands. Buying all these tools separately can easily cost you upwards of hundreds of dollars, but if you bid on this auction before closing time you wont be paying any of those high prices! Physical inspection of this property is encouraged and highly recommended. These hand tools have been used, so if you would like to inspect them in person before deciding whether or not to place a bid then you must contact the auctioneer ahead of time to schedule an appointment. This auction is located in Denver, Colorado, and the closing time is on April 13 at 2:44 pm central time. Right now, the current bid is $30 USD and there have been 3 bidders so far. For any further information, simply click here to subscribe to www.governmentauctions.org for your FREE 3 day trial. Have A Stare At This Hardware! Are you looking to purchase new hardware? Well then check this auction out because it has just that and much more! This lot consists of miscellaneous hardware that was excess to a facility. It contains fluorescent lamps, O-rings, gaskets, misc. plumbing washer seats, misc. washers, misc. screws and faucet repair components. All sold with no warranties. Purchasing all this hardware individually can be pretty expensive and can easily cost upwards of a few hundred dollars, but if you bid on this auction before closing time you can have the chance of owning all this equipment for an amazing low price! The hardware seems to be in good working condition. If you would like to inspect these items in person before deciding whether or not to place a bid then you must contact the custodian ahead of time to schedule an appointment. This auction is located in Mountain Home, Tennessee and the closing time is on December 17 at 5:04 pm central time. Right now, the current bid is at $30 USD and there has been 2 bidders so far, so make sure that you become the very next person to bid and have a chance at winning a whole bunch of hardware! For any further information, simply click here to subscribe to www.governmentauctions.org for your FREE 3 day trial. All The Tools You May Need! Check out all these tools up for auction! This auction features an estimated 80 pounds of assorted hand tools. Included in this lot are screwdrivers, hammers, power tools, pliers, wrenches and more! These tools come in various brands, types, styles, colors and conditions. This lot of items would normally cost you upwards of hundreds of dollars, but if you bid on this auction before closing time you can have a chance at bringing home a large variety of hand tools for a special price you wont be able to find anywhere! Physical inspection of this lot is encouraged and highly recommended. These pieces may have unknown mechanical problems. If you would like to inspect these tools in person before deciding whether or not to place a bid then you must contact the custodian ahead of time to schedule an appointment. This auction is located in Denver, Colorado and the closing time is on December 15 at 2:41 pm central time. Right now, the current bid is only at $205 USD and there has been 4 bidders so far, so make sure that you become the very next person to bid and have a chance at bringing home all of these amazing tools! For any further information, simply click here to subscribe to www.governmentauctions.org for your FREE 3 day trial. All The Tools You Can Get! If you’re in need of new tools, you must check this auction out! This auction is featuring 1 lot of approximately 650 pieces of miscellaneous tools. The tools included are sockets, extensions, pullers, punches and much more! A lot of tools this large can be pretty expensive costing upwards of hundreds and hundreds of dollars, but if you bid on this auction before closing time you can have a chance at getting not one but over 600 pieces for a great low price you cant get anywhere else! Some parts may be missing and minor repairs may be required. If you would like to inspect these tools in person before deciding whether or not to place a bid then you must contact the custodian ahead of time to schedule an appointment. This auction is located in Huron, South Dakota and the closing time is on October 20 at 2:46 pm central time. Right now, the current bid is only at $10 USD and there has been 1 bidder so far so make sure that you become the very next person to bid and have a chance at bringing home all these amazing tools! For any further information, simply click here to subscribe to www.governmentauctions.org for your FREE 3 day trial. Are you in need of a variety of hand tools? Well then check this auction out because it has all the hand tools you can think of and more! This lot is estimated to consist of sockets, hammers, a tool set, and a tool box measures. All items are untested and no warranty is implied or given. Shipping costs and coordination of any kind in regards to the shipping of items are the responsibility of the successful bidder. This tool box is filled with hand tools and has a value of a couple hundred dollars, but if you bid on this auction before closing time you can have a chance at winning this whole toolbox for a steal! If you would like to inspect this tool box in person before deciding whether or not to place a bid then you must contact the custodian ahead of time to schedule an appointment. This auction is located in Arden Hills, Minnesota and the closing time is on August 27 at 5:02 pm central time. Right now, the current bid is at $55 USD and there have been 3 bidders so far, so make sure that you become the very next person to bid and have a chance at bringing home all these appliances! For any further information, simply click here to subscribe to www.governmentauctions.org for your FREE 3 day trial. Your Garden Will Thank You! Are you looking to start working on your garden but need a bunch of tools to get the job done? Well then look no further! This lot consists of a variety of gardening implements and tools including a trimmer, grass-hog, chainsaw, weed whackers and more! The items up for auction are in good working condition with some minor repairs that may be needed. Instead of going out and individually purchasing multiple garden tools, this one auction can save you time and money and provide you with all the tools you may need. All of these gardening tools can rack up to hundreds of dollars but now is your chance to get all of these products for a great low price! If you would like to inspect these items in person before deciding whether or not to place a bid, then you must contact the custodian ahead of time to schedule an appointment. This auction is located in Salem, Oregon and the closing time is on June 26 at 7:01 pm central time. Right now, the current bid is $50 USD and there are 3 bidders so far, so act fast and have a chance at winning this auction. For any further information, simply click here to subscribe to www.governmentauctions.org for your FREE 3 day trial. Check Out This Handy Auction! Do you have a lot of work to do around the house and need the tools necessary to get the job done? Well, put your hardhat and boots on because it is time to hammer away at this auction! This auction has one lot that consists of 80 pounds of an assortment of used hand tools. These hand tools include staple guns, hammers, wrenches, pliers, screwdrivers and many more! These different hand tools come in several brands, colors, styles, and conditions. New hand tools can be expensive to purchase but here is your chance to get a variety of working tools at a low price! If you would like to inspect these hand tools in person before deciding whether or not to place a bid then you must contact the auctioneer ahead of time to schedule an appointment. This auction is located in Denver, Colorado, and the closing time is on June 2 at 3:24 pm central time. Right now the current bid is only $120 and there are 5 bidders so far, so be sure to be the very next one and have a chance at acquiring some amazing tools! For any further information, simply click here to subscribe to www.governmentauctions.org for your FREE 3 day trial. This Auction Has Got The Tools! Are you a handy man looking for an efficient way to store all your tools and appliances? Well look no further because this auction is perfect for you! This lot consists of a 2-part Craftsman Professional series tool box. The drawers on this red tool box are fully usable and can hold plenty of tools you may need to store. This item only has a few minor deficiencies such as missing bearings and a bit of rust on the appliance itself, but other than that its ready to use! Tool boxes can usually cost a few hundred dollars, but bidding on this auction can give you a chance at winning this item for a great low price! If you would like to inspect this tool box in person before deciding whether or not to place a bid, then you must contact the auctioneer ahead of time to schedule an appointment. This auction is located in Brownsville, Texas and the closing time is on May 16 at 3:06 pm central time. Right now the current bid is only $25 USD with 0 bidders so far, so be sure to be the very first bidder and win this item for a great deal! For any further information, simply click here to subscribe to www.governmentauctions.org for your FREE 3 day trial. Get The Tools To Success! Are you someone who likes to do a lot of work around the house or yard? Do you always look for more tools you can add to you toolbox so you can be ready whenever there is something that needs a repair? Well, put your hard hat and work boots on because this auction is giving you the tools you need! This auction has one lot that consists of 30 multi purpose tools. 15 of these tools are “Blast” model, and the other 15 are “Kick” model. These multi purpose tools come in various styles and conditions, and some come with and without pouches. These multi purpose tools are used, so if you would like to inspect them in person before deciding whether or not to place a bid then you must contact the auctioneer ahead of time to schedule an appointment. This auction is located in Denver, Colorado, and the closing time is on February 17 at 12:40 pm central time. Right now the current bid is $100 and there have been 2 bidders so far so make sure that you are the very next one and be the best handyman in town! For any further information, simply click here to subscribe to www.governmentauctions.org for your FREE 3 day trial. Do you do a lot of hand work around the house? Do you have a construction business and are always looking to add some more tools to your tool box? Well, put your construction hat and work boots on because it is time to hammer away at this auction! 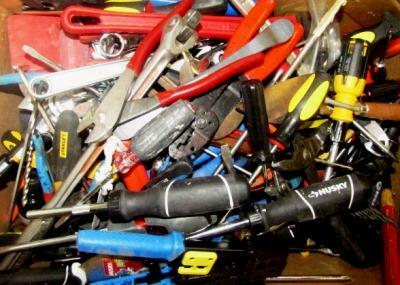 This auction has one lot that consists of 100 pounds of used assorted hand tools. These hand tools include screwdrivers, hammers, power tools, pliers, and wrenches. These assorted hand tools come in different brands, types, styles, colors, and conditions. Hand tools can be expensive, but here is your chance to get some at a cheap price! If you would like to inspect these hand tools in person before deciding whether or not to place a bid then you must contact the auctioneer ahead of time to schedule an appointment. This auction is located in Denver, Colorado, and the closing time is on December 16 at 4:10 pm central time. Right now the current bid is only $10 and there has been just 1 bidder so far, so be sure to be the very next one and have a chance at acquiring some great hand tools at a very low price! For any further information, simply click here to subscribe to www.governmentauctions.org for your FREE 3 day trial. These Tools Are Perfect For Any Handyman!